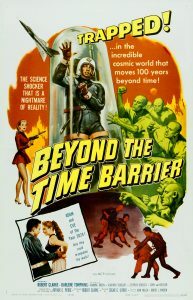 The highlights of the film and worth far more than the price of admission are the scenes in which Robert Clarke first breaks the time barrier up in space (in physics, this sounds like what is currently referred to as a “wormhole” in contrast to the older concept of time dilation) and the scenes after he touches back down to earth. The scene in which Robert Clarke observes the exterior of the futuristic city along with the pulsating solar energy tower is fascinating. (I first saw this when I was ten years old and never forgot it.) Also the scenes of Darlene Tomkins are also a delight for the eyes (especially the swimming pool scene – I never forgot this either). I also liked the triangular designs. They looked almost out of Die Blaue Reiter (The Blue Rider) Gruppe – the Munich Art School that specialized in abstract expressionism (producing such greats such as Klee, Marc, Kandinsky, others) or, perhaps out of the Bauhaus School of Architecture which produced such greats such as Ludwig Mies van der Rohe and others who pioneered modern futuristic design. For this, the art designer for the movie, Ernst Fegte should take a bow. However, the overall plot is somewhat disappointing after Robert Clarke is captured. The idea that the human race can bring the earth to such a state in which it is perilous to walk the actual surface of the earth due to excessive radiation because the protective atmospheric screens had been decimated (the ozone layer in the stratosphere, for example) seems very dreary indeed (The scientist played by Istvan Bekassy mentions the ionosphere being contaminated by nuclear particles). Furthermore, what happened to the various animal and plant species ? Were they decimated, too ? Perhaps the writers could have planned a less dismal story. As the story progresses, the plot becomes even more pessimistic with the sterility of the population, the evil scientists, the barbarity of the mutants, the almost complete resignation to the eventual extinction of the human race as voiced by the Supreme, Vladimir Sokoloff, and the murder in the final reel of Trirene, his daughter, played by Darlene Tomkins. In general, the writers could have done a lot better, in terms of plot, theme, and characters.